This was our 3rd park job of the year. The previous 2 had brought us some sunshine and we were hoping for the same today. Unfortunately nobody got that message as today we had sun, rain and wind! 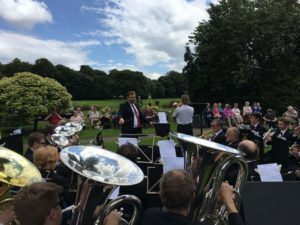 Still, in true good old British spirit the audience brought out their umbrellas and ‘the band played on!’ There were some superb soloists throughout with our principal cornet player Alison Ingram, principal trombone Damian Hall and last but not least our solo euphonium player Louise Crooke. The whole concert was well received by the audience. 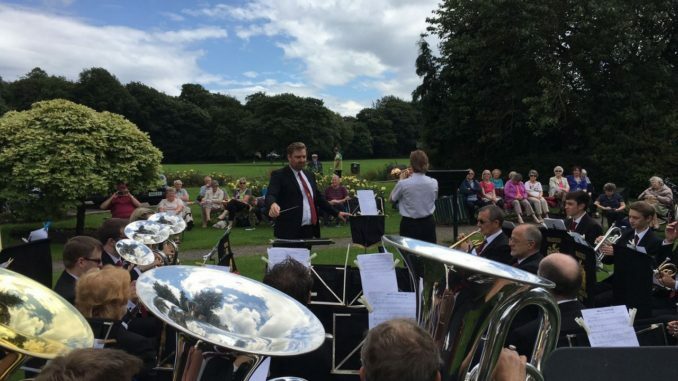 Now we move on to RHS Harlow Carr Gardens in Harrogate and we hope to see you there!